by dave at Jan. 15, 2014, 12:38 p.m.
I’ve spent some time testing EggLab: clicking on algorithmically generated eggs on backgrounds taken from nightjar nest sites and recording the time it takes for each egg. It’s designed for lots of people to play in parallel, but I wanted to test it before coming up with more gameplay mechanic ideas. 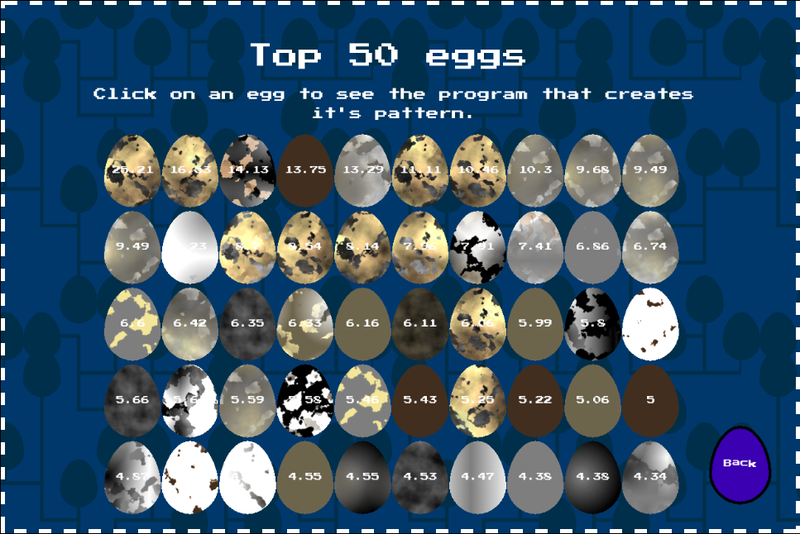 The timing is used to rank the eggs, I keep the top 1024 individuals that took longest to find, and generate new ones from them. The idea is that successful traits will increase throughout the population and the average score will increase – from this small test it seems to be the case, a slow but consistent rise over the latest 500 eggs. For more information, see the full blog entry here.